Anna M. Phillips for The New York TimesShael Polakow-Suransky, the chief academic officer of the New York Education Department; Sean Feeney, a principal; and Elijah Hawkes, a former principal. March 20, 2012, 10:47 a.m.
Sean Feeney, principal of the Wheatley School on Long Island and a co-author of a position paper opposing the new evaluation system, argued that the formula’s ability to override a principal’s opinion suggested “the lunacy of the system.” Mr. Feeney and other principals have called for lawmakers to eliminate the evaluation system’s use of students’ scores on the state math and English exams until after new, potentially improved assessments have been phased in years from now. 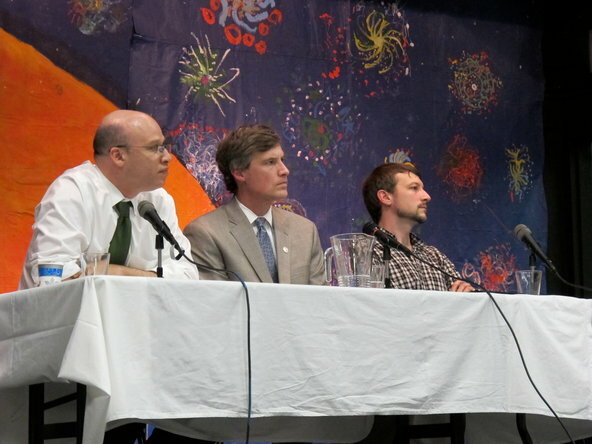 The panelists also debated the effects that the state standardized exams have had on schools, where they are administered every year to students in grades 3 to 8. While Mr. Feeney and Elijah Hawkes, the former principal of the James Baldwin Expeditionary Learning School, argued that the tests had narrowed the curriculum in schools across the state, Mr. Polakow-Suransky said that many schools had continued to offer students a full experience. Parents and teachers in the audience — who applauded when Mr. Feeney called the state’s standardized tests “flawed” — said the effect of high-stakes testing was most apparent in schools in poor neighborhoods. One woman introduced herself as the mother of two children at Public School 8 in Brooklyn Heights, and a teacher at a school in Oceanhill-Brownsville. While her own children learn to be inquisitive and think critically, her students’ days are full of mind-numbing test prep. Mr. Polakow-Suransky said that while this constant practice had been a part of some schools for decades, it was not effective and would not produce the desired payoff in test scores the principal may be seeking. “I should add that my school gets an A,” the teacher said, referring to the Education Department’s practice of giving A through F letter grades to public schools every year. Dao Tran, whose daughter attends a school in the South Bronx, said that teachers were spending time instructing young children in how fill out bubble sheets; meanwhile, the school has no money for field trips. “In her school, I don’t see how it’s helping the kids, I don’t see how it’s helping the community, all I see the money is not there,” she said. Anna M. Phillips is a member of the SchoolBook staff. Follow her on Twitter @annamphillips.